What a great Summer skirt by Tasha Polizzi, this Summer you will see prints in hues of red and burgundy. The pheasant style skirt is soft and flowy. It will look great at the office with boots or dress it up for Sunday Church with a pair of nice sandals. This skirt with a graphic tee and boots is just screaming Cowgirl Fashion and effortless style. The skirt has a slouch yoga style waist band with a contrasting print. The skirt is a shin length. 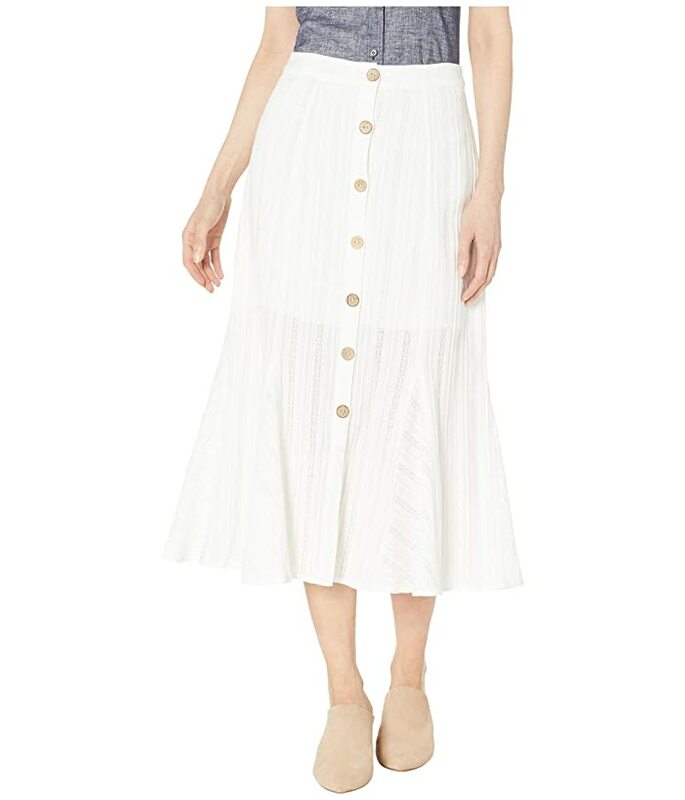 The Miss Me™ Button Flare Midi Skirt delivers a much wanted summery style. This is the perfect skirt to add to your closet. This is a great piece for pairing with your boots and tops for the office or a weekend out with the gals. This tiered skirt is flowy and so soft. The skirt can be dressed up with a nice blouse and your Turquoise for those Spring and Summer events. The light weight tencel skirt will fast become your go to favorite. The skirt is full length. The colors of the East meet the fun attitude of the West with this jade green western lace skirt from Cute Options. This skirt features slanting lace patches with an ethereal feel that circle the hemline, with additional floral embroidery and patches throughout. This skirt is just a little but gypsy, just a little bit Eastern, and is perfect for your Spring and Summer adventure wardrobe! A bohemian art inspired 3/4 skirt with blue and orange flowers in various art styles set against blue, white, and orange backgrounds. An elastic waistband makes this an effortless fit for any body type, and the skirt is finished with lace trim. Electric blue turquoise bursts from the outer layer of this western skirt, accented by bright flowers. The outer layer of this skirt is a sheer fabric that moves independent of the lining, giving this skirt an ethereal appearance. Made from breathable fabric with a gentle stretch to give you the perfect fit.